Until the early twentieth century the horse was a part of everyday life - just look at some of the early photographs on this website of, for instance, Middle Street or High Street and a horse is almost certain to be seen somewhere, usually pulling a cart or a trap - even the early omnibuses that ran between the hotels and the railway stations were pulled by horses. When I worked in the Architect's Department of the Council in the 1970s I remember in the Chief Technical Officer's bookcase was a Register of Corporation Horses that recorded all the details of the Council's horses. This register is now kept at the Community Heritage Access Centre. The register covers 38 horses used by the Council between 1905 and 1954, with each horse having its own double-spread page detailing its type (such as Chestnut Cob, Dark Bay Mare, Red Roan Horse or Bay Cart Gelding), age, sometimes its height in hands, when it was purchased, who it was purchased from and the price paid. This is followed by the horses medical history during its employment, when it was laid off, rested, visited by a vet, etc. The horses are only referred to by number in the register although I'm sure they all had names. Injuries and illnesses were recorded along with remedies and the length of time each horse was given to recover. One frequent apparent medical condition suffered by several horses was called 'nightfall' but despite extensive searching I am unable to determine exactly what this condition is - so if anyone can help, please contact me. Most of the horses were around 5 or 6 years old when bought and the average number of years they worked was around 9 years with nearly half working over 10 years and three worked for 16 years. What happened at the end of each horse's employment at the Corporation is not always clear but 10 were sold, 14 had to be destroyed, 4 died 'in service' and two were killed in accidents. In 1912 a bay horse "Died suddenly working on Housing Scheme" and another horse was stopped from working by police in 1914. This horse was sold two weeks later. In 1919 a light bay horse was involved in an "Accident in Hendford. Shaft of trap driven by Mr Jolliffe, Beer Hackett, run into right breast" and the horse died from its injuries two days later. A cob pony was also killed in an accident in 1938, at Ilchester Road. Another accident, but with a happier outcome, occurred in August 1917 and was recorded in the register - "Happened accident in Princes Street, by being run into from behind by run away horse belonging to Mrs Chainey, Cromwell Road. Wheel of wagon attached to run away horse locked with wheel from cart forcing the mare onto the footpath when she was thrown onto her haunches and with her fore feet broke the plate glass window of Mr Coles shop." The horse recovered and was back to work within a month, continuing until 1924. As a sidenote - government inspectors visited Yeovil to requisition horses for war service during the Great War but it appears from the Register of Corporation Horses that none of the Corporation's horses were taken. Even so, around six million horses served in the Great War but because Britain's horse population at the time was between 20,000 and 25,000, horses were imported from Australia, Canada, the USA and Argentina for war service. By 1911 the Corporation employed 11 horses and until 1926 about 12 horses were employed at any one time. From then until the outbreak of the Second World War the average dropped to about 8 at any one time. The number of horses dwindled until by 1944 only two horses were employed. Two new horses were purchased in 1945 and one in 1946. From 1950 until 1954 this last horse, a bay Welsh mare, was the only one employed by the Corporation. It was sold to Councillor D Vincent and finally left the Corporation's service on 19 May 1954, thus ending the era of the Corporation's horses. 49. The Borough Surveyor Reported that Horse No 2 had recently been examined by Mr JD Hall, Veterinary Surgeon, and was found to be suffering from Chronic Lymphongitis, which was likely to give trouble from time to time. Mr Hall recommended that the Council should dispose of the horse, stating that in his opinion it would be suitable to work on a farm. RESOLVED that the horse be worked for a further month and that in the meantime the Borough Surveyor be instructed to enquire of Mr Hall whether or not there is any permanent cure for the animal. 25. Reference item 2 of the last minutes, the Town Clerk reported that the Council at their meeting on 11 October instructed that Horse No 2, which is suffering from an incurable disease, should be slaughtered in the Town Yard and sold. The Borough Surveyor stated he had received several offers for the purchase of the animal, the highest of which was from Mr H Wright, Mudford Road, who offered £25 to slaughter for human consumption. Councillor Shorney stated that Mr Wright had informed him that his offer of £25 was subject to the horse being conveyed some considerable distance from the town, where it would be slaughtered and sold for human consumption, but if it was a condition of the sale that the horse must be slaughtered in the Depot, then he was unable to offer more than £15. RESOLVED that Mr Wright's offer of £25 be accepted and that the Borough Surveyor be instructed to arrange for a Corporation employee to travel with the animal to the place of slaughter and witness the killing. 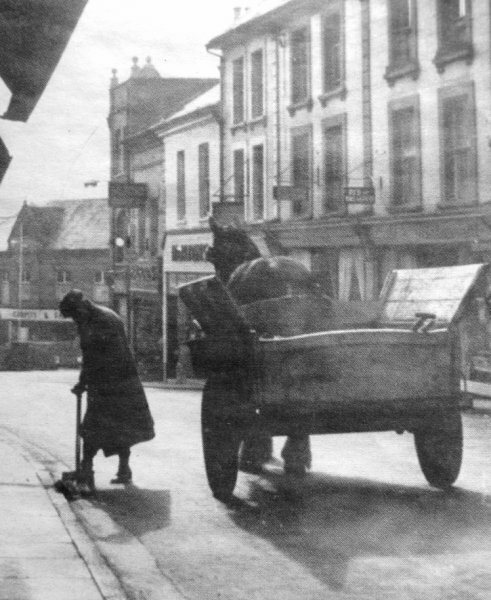 This photograph, showing a Council street cleaner with his horse and cart, probably dates to around 1930 and was taken from outside Neal & Williams' premises in Middle Street and looks towards the Triangle. 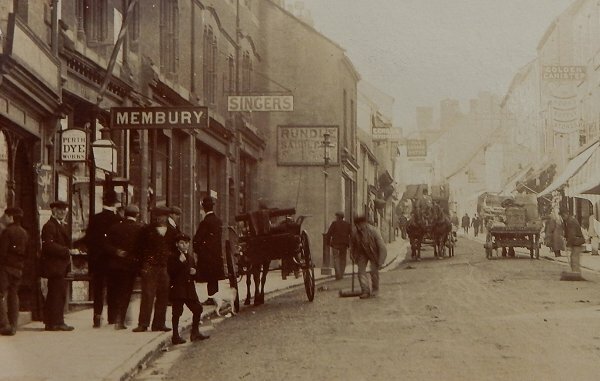 A photograph of around 1910 looking along Middle Street to the Borough, with two council road sweepers (one at centre, one at extreme right) with their horse and cart left of centre. 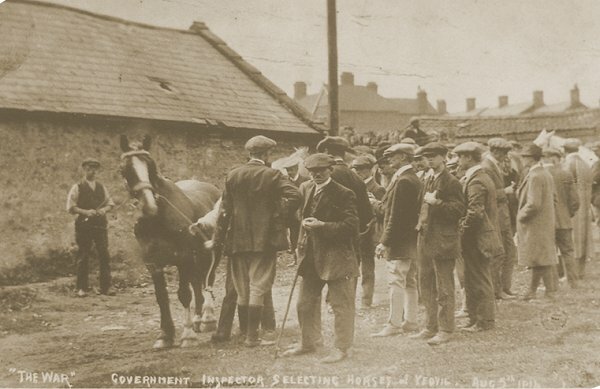 Government inspectors visited Yeovil to requisition horses for war service during the Great War but it appears from the Register of Corporation Horses that none of the Corporation's horses were taken. Around six million horses served in the Great War but because Britain's horse population was between 20,000 and 25,000 horses were imported from Australia, Canada, the USA and Argentina.